YORKSHIRE’s dream of winning the treble is over, but first team coach Jason Gillespie insisted that his players will come back fighting as they target the next best prize of a league and cup double. Yorkshire failed in their attempt to win the NatWest T20 Blast for the first time when they lost by seven runs to Durham in the semi-final at Edgbaston on Saturday. However, Gillespie’s men are still in the hunt for a hat-trick of County Championships and they are through to the Royal London Cup semi-finals for a second successive season, with Yorkshire determined to put behind them their T20 heartbreak. “We were bitterly disappointed to lose the T20 semi,” said Gillespie, “but there’s still everything to play for in the next few weeks. “We’re still in the 50-over comp and the Championship, and we’ll dust ourselves down and crack on. “We can look back on the T20 campaign by and large with a lot of pride, considering the way that we started the tournament (Yorkshire won only one of their first seven games before winning six of the last seven to reach the knockout stages). Yorkshire came up against a world-class display from England pace bowler Mark Wood, who captured a T20 career-best 4-25 from four overs after Durham scored 156-6 in the second semi-final, Northants beating Nottinghamshire by eight runs in the first semi-final. Wood twice took two wickets in three balls – including the key scalps of England batsmen Jonny Bairstow and Gary Ballance – after Ben Stokes had earlier top-scored with 56 on his return to the Durham side after a calf injury. “Mark Wood bowled beautifully,” said Gillespie, with Wood following that performance with 1-25 in the final against Northants, who went on to take the trophy with a four-wicket win. “We were going along quite nicely and then we lost two quick wickets (Bairstow and Ballance), and we didn’t quite recover from that. “I certainly felt that it was a gettable total, especially with the strength and depth of our batting line-up, and we should have chased those down. With hindsight, Gillespie felt that Yorkshire might have made more of an effort to see off Wood, although that was clearly easier said than done. The 26-year-old right-armer, who only recently returned to action after ankle surgery, was bowling at 90mph and he would have been a handful for any opposition. “Maybe we just needed to soak up the pressure a little bit more and get through his (Wood’s) spell, knowing that he only had four of the 20 overs, and maybe there are some lessons to be learned there,” said Gillespie, whose side take on Surrey in the semi-finals of the Royal London Cup at Headingley on Sunday. “We just weren’t able to win the key moments, and Wood took the wind out of our sails. 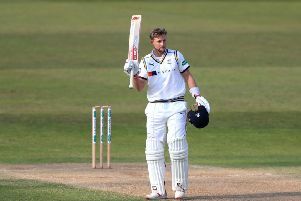 Yorkshire captain Alex Lees echoed Gillespie’s sentiments at the end of an encouraging T20 campaign for the club overall, with Yorkshire having only once previously reached Finals Day. Lees hit the second-highest score of 22 on a day when Adam Lyth (64) led the Yorkshire chase. “Woody tipped the scales, and when you twice get two wickets in one over, it certainly puts the opposition on the back foot,” said Lees. “We’re bitterly disappointed, and I just think that we lacked somebody in the middle order to make a contribution. Attention now returns to the Championship, with Yorkshire going into tomorrow’s game against Notts at Scarborough in second place in Division One, 26 points behind Middlesex with a game in hand. Finals’ Day report: Page 9.